Facebook: Simple solution to distribute your audio/video, internet, computer, gaming, TV, movies etc. around the house. Item 79: $49.95Can or $37.00us per pair Brand New. 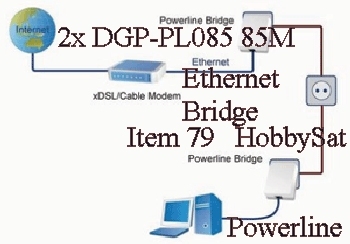 DGP-PL085 85M Powerline wall mount ethernet bridge 2x. Adapter extender kit external turbo mega plug ethernet interface. Retail Price: was $189.95, then $114.95. We discount to $49.95. in the wall. All with no new wires! Spend less time setting up, and more time streaming and gaming. Internet-enabled device, plug it into any outlet, and start streaming. Shipping Weight: 520 grams 1 lb. 2.2 ounces. No neeed for new wires for Home networking. you might want to use a networked device. Ranges up to 200 metres. Deliver the benefits of Ethernet without the wiring expense. Fully compliant with IEEE 802.3, IEEE 802.3u and HomePlug 1.0/Turbo standards. Windows system for encryption setup. 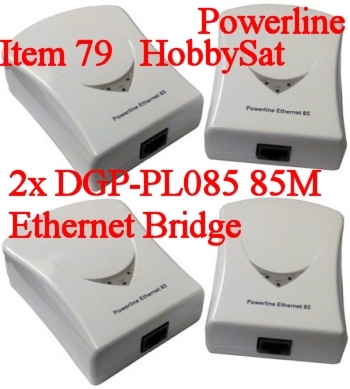 Get a DGP-PL085 85M Powerline adapter for your media stuff throughout the house. 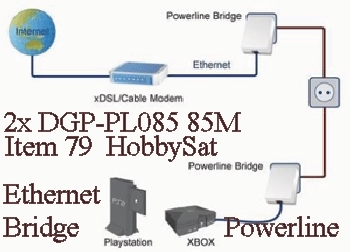 Get a DGP-PL085 85M Powerline Adapter for Skyping and Video Calling/Chatting. - Uses the home's existing powerline at any power outlet. 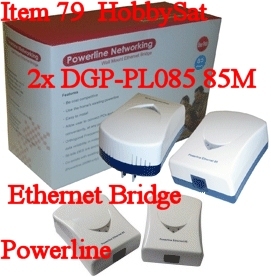 - High-speed Powerline adapter with ethernet interface. - Connect any 1 internet ready device: PC, TV, IPTV, Blu-ray player, printer server, or gaming console. - Easy setup install - Plug and Play and simple to use. - Speed - fast data transfer rates up to 85* Mbps data rate. - Even transmit video in DVD quality. - 56 bit DES link encryption for security. - Orthogonal Frequency Division Multiplexing for high data reliability in noisy media conditions. 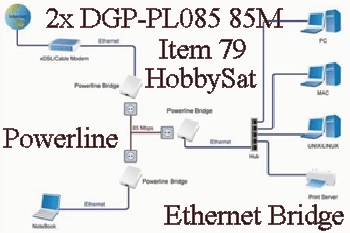 - Co-exists with existing Powerline 14M and 85M or others. Turn any electrical outlet into a high-speed network connection. directly to computers and other network devices through the household electrical wiring. Send data with speeds of up to 85Mbps. Ideal for areas that are hard to reach by wireless connections. through any power outlet for the easiest way to get a fast and reliable online connection. The Ethernet port on the adapter makes it easy to stream Internet data. Temperature conditions: 0°C to 50°C, 32°F to 122°F. • Frequency Band: 4.3 MHz. cables around the house and deliver video/data from one part of the house to the other. The price is good for us too. Judy M. April 25, 2017, Halifax.